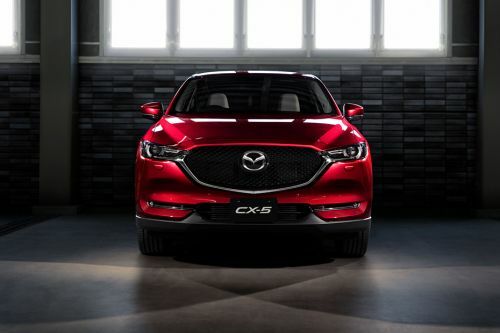 CX-5 is available in 10 different colors - Arctic White, Snow Flake White Pearl, Deep Crystal Blue Mica, Eternal Blue, Jet Black Mica, Meteor Gray Mica, Sonic Silver Metallic, Soul Red Metallic, Titanium Flash Mica and Grey Premium Metallic. The all-new Mazda CX-5 is a compact crossover SUV, which was first launched in the year 2013. This compact vehicle shares the same 'Soul of Motion Design' platform of KODO, which depicts a noticeable 'eye-catchy' design philosophy. Moreover, this is also Mazda's first vehicle using Skyactiv Technology that reduces overall weight of the vehicle, its emission count and fuel consumption. Launch of this SUV in UAE market comes as a replacement for the already existing CX-7 model. Interior of this vehicle offers you airy and spacious two-row cabin with seating capacity of 5-passengers at a time. The cockpit of this SUV is embedded with numerous functional features like dual automatic air conditioning, leather covered steering wheel with audio controls, power windows, map reading lamps and illuminated trip computer for information of driver. There is a radio with AM/FM tuner, CD drive with MP3 player, 4-speakers in-an-all boasts equitable sound output making your journey rid of boredom. Also, its cabin has plenty of storage spaces and a boot compartment that has a volume of 503-litres. Beside these, there are cupholders, centre console storage space, sunglass holder and seat back pockets adds to the conveniences inside. Its exterior designing has received little instincts from Mazda 3 and 6 models. Its layout is a striking balance of numerous appealing inserts that increases the overall elegance of the SUV. Modish exterior grille has got chrome detailing, which is extended to broad sweeping headlights on the lateral side. Its precisely built rear facade is embellished with shark fin-like roof antenna and dual exhausts, which increases its sportiness. Overall dimensions of this 5-door SUV measures at 4540mm in length, 1840mm in width and 1670mm in height along with the wheelbase of 2700 mm. The sporty character is further enhanced via 17-inch alloy wheels with tyres of size 225/65 R17. This stylish vehicle is complemented by the intelligent SKYACTIV technology, which is an ideal balance of driving pleasure, ingenuity and efficiency. It offers five different variants packed with 2.0-litre and 2.5-litre engine capacity. Its 2.0-litre engine churns out a maximum power output of 155 HP at 6000 rpm along side a peak torque of 200 Nm at 4000 rpm. Whereas, bigger 2.5L generates power of 185 HP at 6000 rpm along with the peak torque of 250 Nm at 4000 rpm. Coupled with 6-speed activematic transmission, this SUV rages towards high speedy winds dispatching 0-100 km/hr in 9.8 seconds with the 2.0 litre engine. Flaring up the reasonably economic drive, it gives a decent mileage of 14.7 kmpl in a combined cycle. Featured with anti lock braking system (ABS) and electronic brake force distribution, this crossover SUV remains stable in-track even in utmost emergency situations. Furthermore, traction control system apply brake friction to the spinning wheels in lessened traction bringing the vehicle to stop or low speed in balance. Standard front and side curtain airbags are employed that actuates at the time of collision. Besides these, there are front and rear seat belts with pretensioner, ISOFIX child seat anchors and immobilizer that works as added safety. This vehicle is strong on styling part and henceforth stands out in a bunch of compact SUV cars segment in the market. But, coming to its interior aesthetics, it lacks high-tech, safety and utility features as compared to its rivals. What is the price of Mazda CX-5? On road prices of Mazda CX-5 in starts from AED91,500 for base variant 2.5L GS 2WD, while the top spec variant 2.5L GTX AWD costs at AED129,900 . What are the colors options available in Mazda CX-5?